The morning was crazy, and lovely, and crazy again. I don't remember how I fell asleep (face-first into THE EXORCIST on the Kindle, probably) but I do remember how I woke up. From a dog lick in the face and a frantic escape of paws scraping on the wooden floor. Then more dogs arrived. It was the dog-sitting day at my darling hosts' house, and they were: Piper, a chocolate lab (at least I think it's lab, I'm most likely wrong); Fuzz, a tawny hairy poodle; Leo, a terrier (I think); and the lady of the house Jazz (although it's short from Jasmine, so maybe it's Jas). Jacquelyn and Kristina had to leave for work and I have tried to concentrate on writing. It went like this. Who can be louder? Leo missed his mama very much and has emitted a volley of noises I didn't think dogs were capable of. It was whining and howling and yapping and clucking (like a chicken) and yowling mixed together. Add scraping at the door. Add frantic gamboling and skipping in circles. Add periodic squeals of frustration at my stoic indifference. I grew up with four dogs, so I have learned my lesson well. I blissfully ignored this brouhaha (in addition to the poodle and the lab deciding to play catch-my-tail-no-catch-yours-can-I-bite-your-ears game), blasted on high volume Dvorák's Symphony 9 and started writing. There was a curious pause. The dogs stared at me quietly. Then Leo decided to show me that he didn't think I won. He proceeded barking at every beat of the drum. It was quite entertaining. I think at some point I found myself typing, one dog on one side of my lap, another on another, and two more sleeping at my feet. Then Jacquelyn came and drove me over to the Union Station and all of a sudden it was time to board the train! I think I have realized I'm leaving after I saw the jaggedy outline of Chicago through the train window, but I was exhilarated. I was back on the train, in my favorite nook! 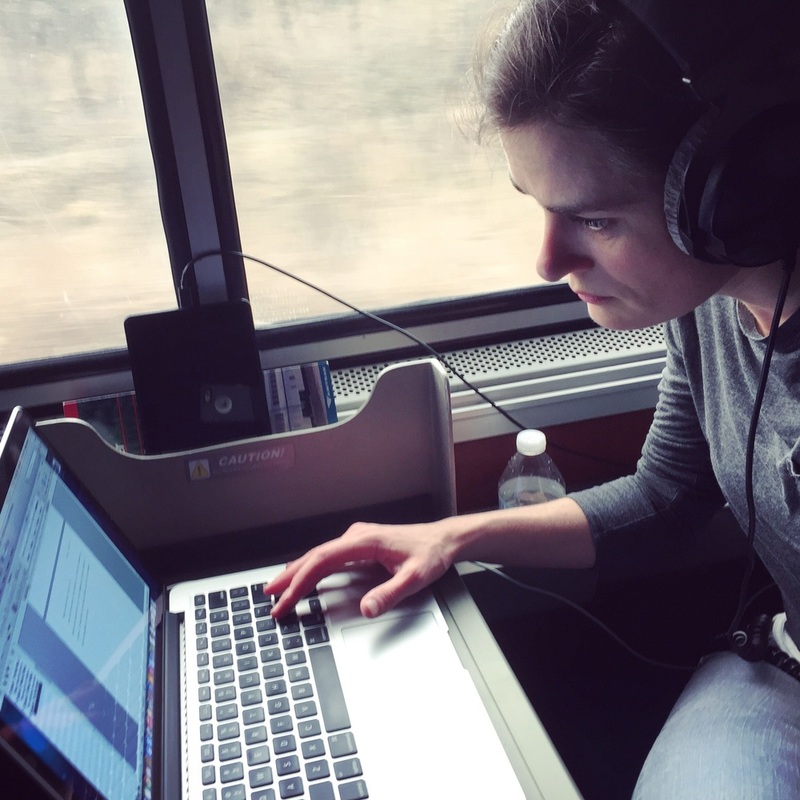 I've managed to write 1.5K words with the doggies, and then set up a writing station in my roomette and banged out 500 more, finishing the chapter. Then I stared out the window. You can never get tired of staring out of a train's window. I read a bit of THE EXORCIST and went to dinner, where I sat at the table with Alan and Vivian who recently celebrated their 50 years of marriage and were traveling from Portland after visiting Vivian's 94-year-old (!!!) father to go on a cruise. They are British but live in France in Bordeaux, so naturally I told them I'm coming over since after eating dinner together we're practically family. Ryan from Texas joined us. He is returning home to his wife of 43 years after having seen his sister in Portland. We had the most fascinating conversation about everything from Roald Dahl to difficult teenagers to the origins of faith to literature to marriage to chocolate versus cheesecake. It was the best dinner I have had so far onboard of Amtrak. My new sport is to meet as many new people at meal times as possible to hear their stories. This is rich soil for new novels. And now I'm staring out the window (again, because you do that a lot when on a train) into a black nothing, comfy in my pajamas and looking forward to waking up to some new vista tomorrow and, of course, more writing.